What if you like the idea of skiing, but really prefer to sip hot chocolate by a roaring fire and simply take in the view of the snowy mountains? 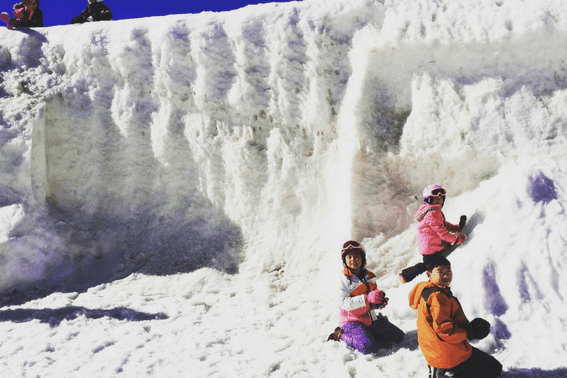 After two previous ski vacations to Taos Ski Valley and Ski Santa Fe, my husband and I realized that we need other diversions besides skiing. On the other hand, two out of our three kids believe they are bound for glory as Olympic slalomists. When we read about Keystone Resort, voted number one by Forbes in January 2017 as the best family-friendly ski resort, we decided to try it out. We wanted to see if Keystone Resort with kids really was the family-friendly resort offering something for everyone. In the past, we enrolled our three children at the ski school, while my husband and I took private lessons. This time, all of us took lessons together at the same time a.k.a. the family private lesson. It worked out perfectly since all of us were about the same level, green bordering on blue. What surprised us was that it became more of a lesson on the family than on learning to ski. Dave was our fearless instructor who took our kids to warm up on the children’s bunny hill. My husband and I trekked around to find two pairs of rental skis because sadly, we had not reserve them in advance. It was spring break, but lucky for us, we claimed one of the remaining two pairs of rental skis on the outskirts of the resort. When we finally returned, we saw our kids on the slopes with Dave looking pretty good. Unfortunately, I seemed to have contracted ski amnesia, a horrid combination of forgetting how to ski and an unreasonable fear of falling on account of my fear of heights. Dave had me do J turns to help fix my tendency to wedge too much. I tried and tried to get my ski legs back and ski parallel. I kept telling myself that it takes much more effort to do a wedge than to do the J turns, but my head continued to mess with me. To make matters worse, I found myself worrying over the kids, which in this case included my husband. I cringed over their stumbles and falls, fearing the worst. Picturing my kids tumbling out of the lifts to their deaths, I clung evermore tightly to my youngest, the runt of the litter. She has always been our littlest, barely reaching 5% on her annual physicals with the pediatrician. She was six years old and all of 43 inches tall and a mere 35 lbs. Naturally, I fretted over her. How would she catch up to us? Was it too late to sign her up for ski school? Her radiant smiles should have eased my fears. I understood at a whole different level what it means when the last shall be first and the first shall be last. Don’t underestimate the baby of the family! Our attentive private ski instructor at Keystone deserves all the credit for boosting my youngest child’s self-confidence. Our family started to look at her differently. She gained respect and more clout, especially in the eyes of her big brother and sister. 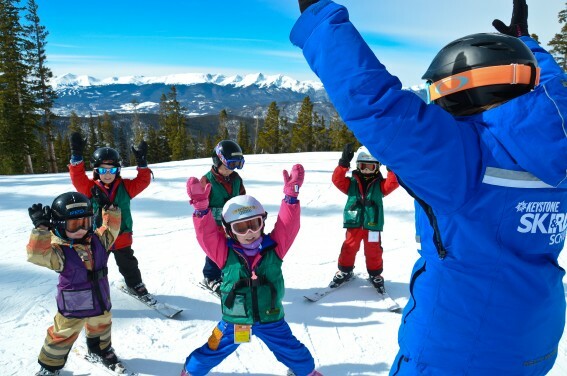 Read Trekaroo reviews on the Keystone Ski and Ride School. 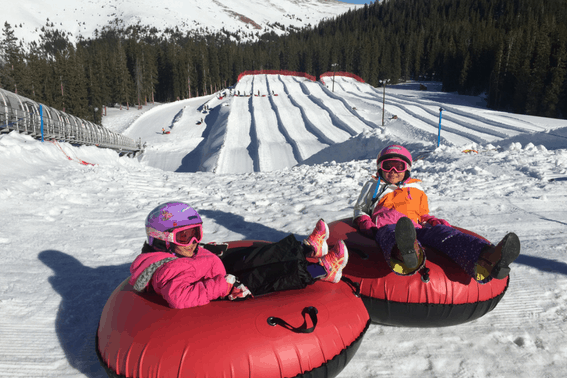 Speaking of tubing, Adventure Point Tubing at Keystone Resort is definitely not the sledding you grew up with. Four perfectly groomed tracks lead tubers down a massive hill at speeds that rival a roller coaster. Children as short as 42 inches are able to participate but as we learned, this activity is best reserved for thrill seeking kids. My son, a roller coaster lover, squealed with delight as he whizzed down the hill with his dad, eager for another ride once he reached the bottom. My daughter, whose favorite ride at Disneyland is still Small World, screamed bloody murder and then let everyone who came within earshot know just how much she disliked the speed of the hill. My husband and I loved it and were especially happy to ride the magic carpet back up the hill instead of having to lug two large inner tubes up the slippery slopes. The private lodging in Evergreen Condos at Keystone is picture perfect. 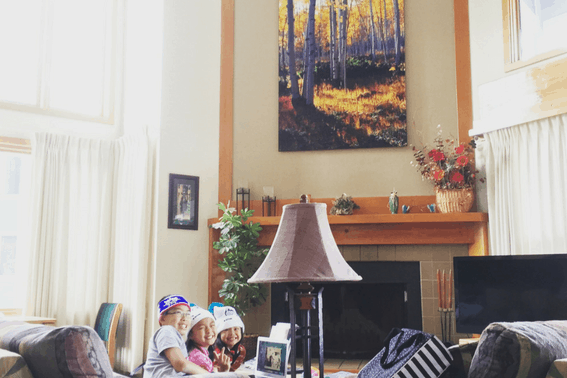 It’s the way ski resorts appear in the movies with the fire roaring inside a two-story condo, winter sport artifacts decorating the spacious rooms, plus a private balcony with a stunning view of the Rockies. My greatest pleasure at Keystone was watching my three children build a snowman together from our private balcony. They came back inside only as the sun was about to set, all wet and cold, but blissfully happy. After they dried themselves, we curled up together by the fire, noisily sipped hot chocolate with marshmallows, and played card games. Later, I sank my weary body into our plush, King-sized beds. After a full day in the snow, sleep becomes sanctuary. Don’t forget to check out Keystone’s Kids Ski Free offer. 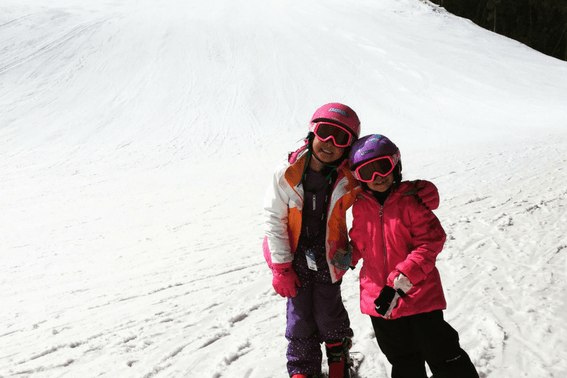 Kids 12 and younger ski for free at Keystone with no blackout dates when families book for just two or more nights. Lodging options range from hotel rooms to family-sized condominiums. Atop the mountain, Der Fondue Chessel serves up fondue family-style in a Swiss alpine chalet that sets the mood for a fun dining experience. Servers dressed in Bavarian costume dish up cheese fondue with all the fixings, salads, and a variety of meat to cook on tabletop grills. Incredible dessert fondue options cap off the experience. Meanwhile, a roaming polka band plays traditional music. When family favorites such as the Hokey Pokey and the Chicken Dance start to play, everyone in the restaurants drops their fondue forks, stands ups, and joins in on the fun. 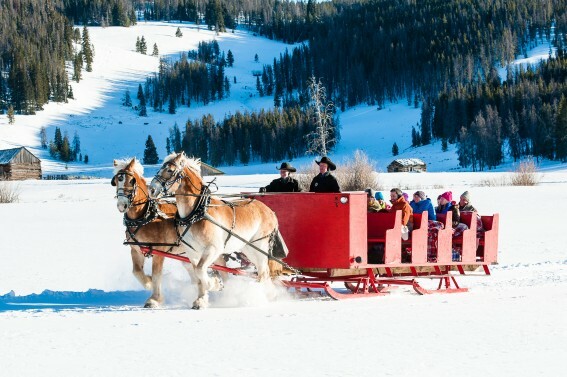 There can be no doubt in our minds that Keystone truly was the family-friendly resort with something for everyone. Want to explore more of Colorado? Check out this guide to visiting Beaver Creek. Disclosure: This review is based on complimentary ski lessons, meals, and activities from Keystone Resorts. All opinions are my own. Lead image by: Keystone/Jack Affleck. All other photos are by Sarah Kuo unless otherwise stated. Fabulous article. this information very helpful. Colorado is a very amazing place. thank you.